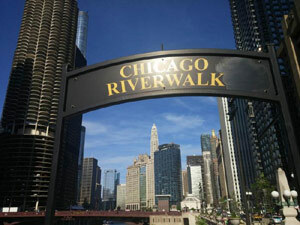 Chicago River: The Chicago Riverwalk is being a familiar tourist and locals attraction. This is the topmost commercial place in Chicago. Besides stunning landscapes, architecture and pathways, there are some important places to visit. The Vietnam Veterans Memorial and its new Riverwalk is connected by the Marina Plaza. The tourists, docking boaters and the pedestrians can find a number of restaurants and ample seating to enjoy the Chicago River’s view. Upper dining terrace, Retail space and Built-in-Bar are the other attractions. This is being a Kayak rental space and dock space. Tourists stop for snacking here for Flanders Belgian Beer & Fries, Restaurants. In this sunny cove, many people enjoy with their families. Adults observe relaxed mood around a fountain amid the water sprays. The floating gardens surround the Riverbank which provides startling views of the convergence of the three branches of the River Chicago. It was opened in 2015, is accessed from Upper Wacker to Riverwalk level. Wendella Water Taxi access is available here. City Winery is a recreational spot who delivers the highest-end culinary and cultural experience. They provide intimate concerts, food and wine classes, private events and fine dining. This is a mere relaxing zone where tourists use to hang out. Though it is similar to Marina Plaza, still no stores are here. Here in Jetty, tourists can observe fish and obtain knowledge about the river ecology. This place is focused on education and aesthetic. The river dyeing is a traditional activity for many years and it attracts a huge crowd in green color dress to watch the live action. 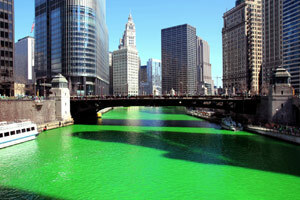 Pouring dye into the Chicago River happens on the St. Patrick’s Day. On this colorful occasion tourists can enjoy a parade, Irish food and drinks offered by vendors at the Chicago Riverwalk. But, the color only last for five hours. So, the viewers should be present at the right time to watch such a wonder hue moments. 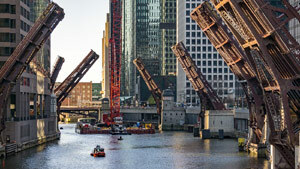 There are 18 movable bridges on the Chicago River. 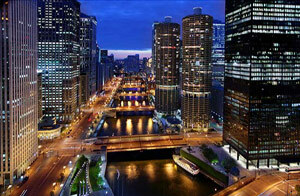 However, Du Sable Bridge at North Michigan Avenue is the most celebrated bridge. The loop bridges are operated for seasonal sail boat. The Riverwalk is levied with no charge and open to the public from 6.00 am to 11.00 every day. Many vendors operate round the clock here. Tourists even from remote corners invade here to eat, drink, play and explore kayaking, dock fishing and a waterside wine patio.